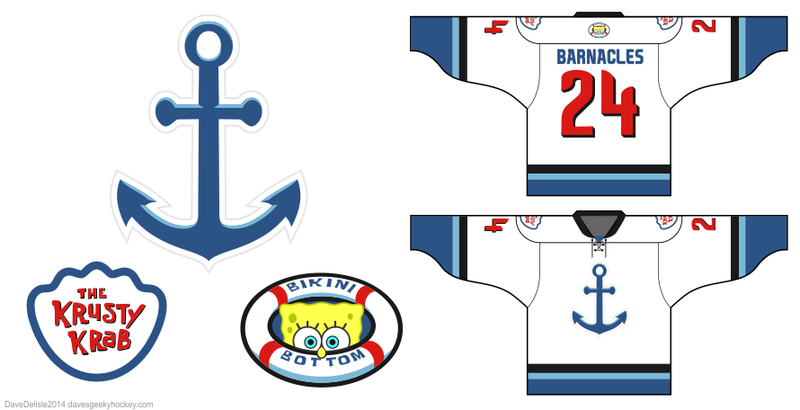 (UPDATE August 3rd 2018) This is an updated version of the old Spongebob jersey, which was tweaked to make it an official product. Apologies to New York Islander fans. This is based on the Krusty Krab uniform, which is just a hat. Being a former fry cook and longtime fan of Spongebob, this was great to see become a reality. Posted on September 9, 2014, in Geeky Hockey Jerseys Available, Hockey Jersey Design and tagged Cartoons, Geeky Hockey Jerseys, Hockey Jersey Design, Krusty Krab, Spongebob Squarepants. Bookmark the permalink. 1 Comment.